The French Revolution of 1789 represents a huge shift in the course of history and in many ways marks the beginning of our modern age. Fuelled by Enlightenment ideas and financial and political crises, the Revolution completely dismantled the Old Regime. This calendar includes everything one needs to know to understand time, astrology, history and contemporary events. 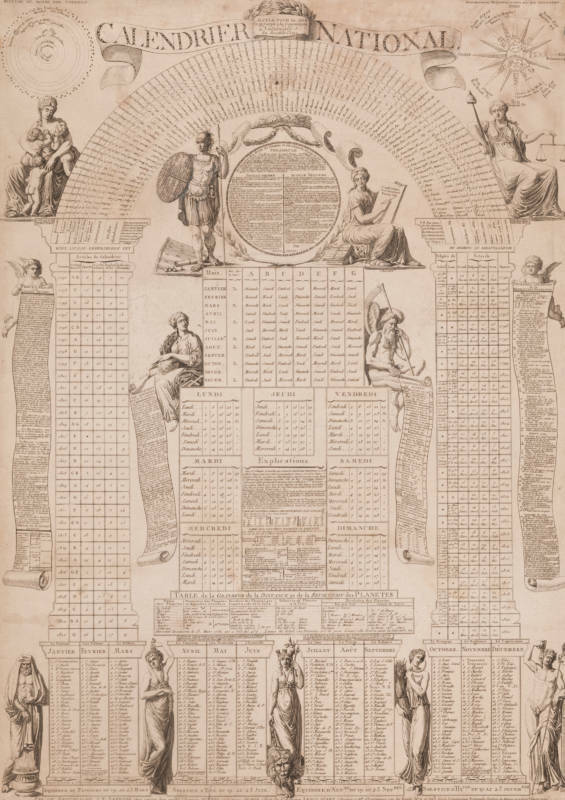 The Declaration of the Rights of Man from 1789 takes up the central medallion while the scrolls and columns describe the major events from the Revolution, a description of France under the Old Regime, a world chronology from the Creation to the Revolution, a chart of the French regions and two verses from the revolutionary song, the Marseillaise, which later became the French national anthem. Despite its intended lifespan, this calendar was made redundant the following year by the introduction of the new Republican Calendar. Engraver of text M. P. Vallet, National Calendar, calculated for 30 years, 1792; Waddesdon (National Trust); acc. no. 2669.3.39. Photo: Mike Fear © National Trust, Waddesdon Manor.